As I've written many times before, I'm a great lover of Studio Ghibli's brilliant art books. You gain a deep appreciation for the painterly skills of the artists, the mastery of their craft. It's easy to forget that animation is nothing more than sophisticated trick photography with a series of drawings and paintings. It is vitally important to retain that connection to the original artwork whenever possible. Kazuo Oga directed his first short film at Ghibli in 2006, with The Night of Taneyamagahara. It's a magnificent work, much more of an illustrated storybook than a typical animation. I'm reminded of many great animation shorts I watched in my childhood, and television shows like Calliope and Gather 'Round, and modern animators like Michael Sporn. Thankfully, Ghibli published an art book to accomodate Oga's film, and it's especially wonderful to see the famed background painter at work. The story was created by the great Japanese poet, Kenji Miyazawa, who has also inspired two of the greatest anime films ever made, Gauche the Cellist and Night on the Galactic Railroad. I think Oga's adaptation is comparable. 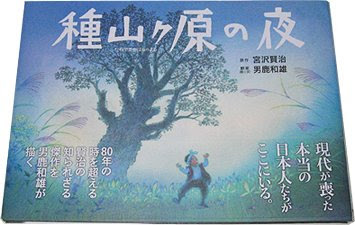 If you're interesting in finding a copy of Kazuo Oga's book, either check the import sites or search the Ebay auctions. I'd love to own this Im a huge fan of Ghibli art books I just can't find it anywhere :( I won't give up though! What's the ISBN number for this book? I really like the art work. I also would like to read someday.